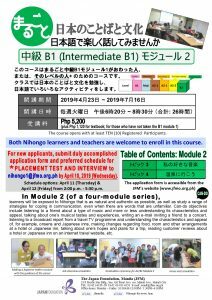 In Module 2 (of a four-module series), learners will be exposed to Nihongo that is as natural and authentic as possible, as well as study a range of strategies for coping in communication, even when there are words that are unfamiliar. Can-do objectives include listening to a friend about a type of music and more or less understanding its characteristics and appeal, talking about one’s musical tastes and experiences, writing an e-mail inviting a friend to a concert, listening to a broadcast report from a travel TV programme and understanding the characteristics and appeal of, for example, onsens and Japanese inns, making changes regarding food, room and other arrangements at a hotel or Japanese inn, talking about one’s hopes and plans for a trip, reading customer reviews about a hotel or Japanese inn on an internet travel website, etc. Both Nihongo Learners and teachers are welcome to enroll in this course. 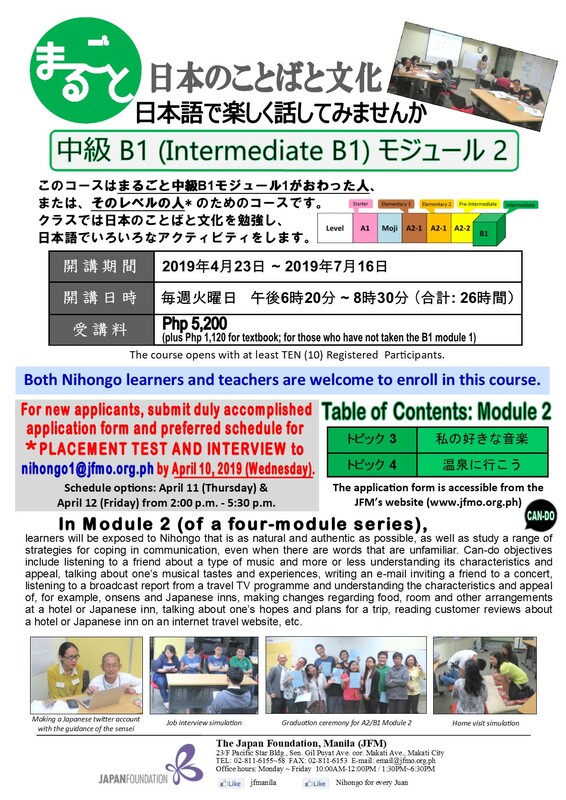 Submit duly accomplished application form and preferred schedule for the *PLACEMENT TEST AND INTERVIEW to nihongo1@jfmo.org.ph by April 10, 2019 (Wednesday). Available schedule: April 11 (Thursday) and July 12 (Friday) from 2:00p.m. – 5:30p.m.